A darkly clad, eyeliner-wearing Johnny Depp could have been sitting in the shadowed corner and fit right in. Hyde Restaurant — formerly Zigz Bistro — has dark purple walls and ominous artwork that may trigger Tim Burton movie nostalgia, which likely conjures up visions of the ‘sinister’ Hollywood actor. 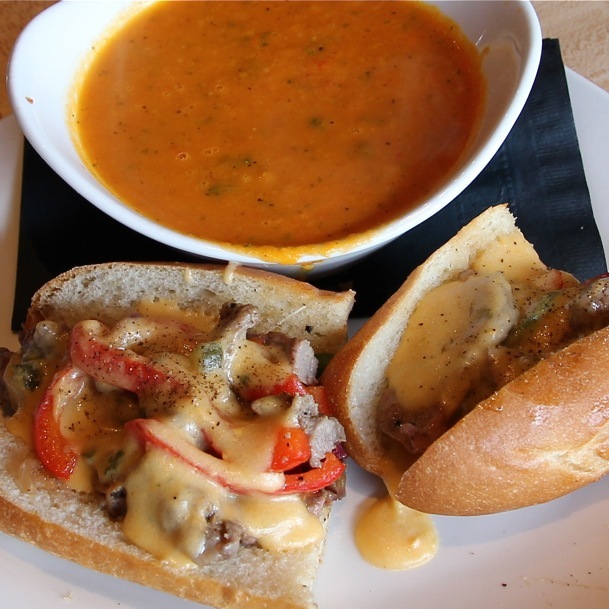 Hyde Philly Cheese Steak — my recommendation from owner Crystal Lowe — and my Vegan Ginger Carrot Soup mirrored the eatery’s wicked, split personality theme: one gooey and guilt-inducing, the other light and healthful. The ‘evil’ sandwich was served on an average white bun and loaded with tender strips of beef, grilled red onions, and peppers, then doused with a mild house made jalapeno cheddar sauce. My ‘good’ lunch item was a piping hot Vegan Ginger Carrot Soup, which was smooth textured and naturally sweetened with peppers. Visit Hyde hungover for Sunday brunch, wearing your party clothes from the night before, and get a Caesar on them.